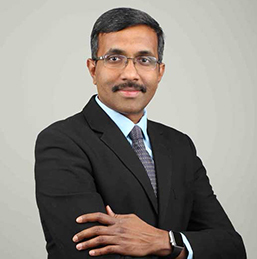 Kumar is the Head of Information Technology for Narayana Health. He brings in over 15 years of technology experience ranging from strategy to execution spanning across various technology domains and industry verticals. He holds a Bachelor’s degree in Engineering with a specialisation in Electrical and Electronics from University of Madras. In addition to this he has completed executive education in General Management from Indian Institute of Management Bangalore. He has significant experience in Strategic Enterprise Architecture, Digital Strategies, Business Service Management, IT Strategy & Transformation, IT Service Management, Enterprise Application Architecture, Technology & Innovation management and Information Security. Before Narayana Health, Kumar was the Director for Pricewaterhouse Cooper’s Cloud Computing practice.